3-4-06: These incredibly fun slabs can be found just 5.5 north of Paradox Valley just off Y11 and/or River Road. 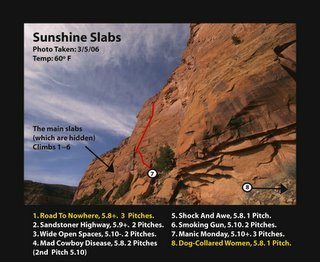 This area has many moderate to easy climbs (5.8 to 5.10), most are two pitches and Manic Monday, the areas highest route, climbs three fun pitches up 300 feet. This week Charlie and I added two 70’ pitches to Road To Nowhere (5.8+). The first pitch is really an “approach pitch” to better climbing above. To the far right (past Manic Monday) we added a stellar 70’ arête/face climb we called Dog-Collared Women, 5.8. These south facing slabs provide the perfect location for winter rock climbing in the sun. Many of these routes require natural protection…for more info visit Wild Wild West Guide Book.